The buildings are ramshackle. The picnic tables could definitely use a fresh lick of paint. The beach is in need of raking. And the dogs are stray. But, the food at Da Conch Shack and Rum Bar in Turks and Caicos is fresh and delish. The Turk’s Head beer is ice cold. The view of the Caribbean Sea sublime. And DJ Natti is cranking out the reggae tunes – even mid-afternoon. My wife and I and our 10-year-old daughter sought out this legendary eatery during a side trip from our nearby luxury digs at the family-friendly Beaches Resort. 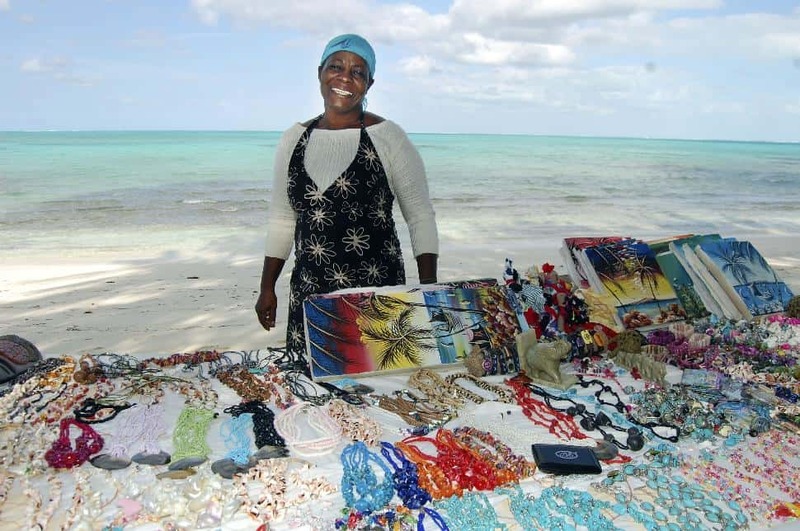 We’d be told repeatedly that Da Conch Shack – always pronounced with that cheeky Caribbean lilt – was the place to go on Turks and Caicos’ main island of Providenciales (nicknamed Provo for those in the know). Admittedly the open air landmark doesn't look like much when we pull up in a taxi. But when we’re shown to our table – a picnic table in the shade of a palm tree on the beach facing the Caribbean – we start to swoon. 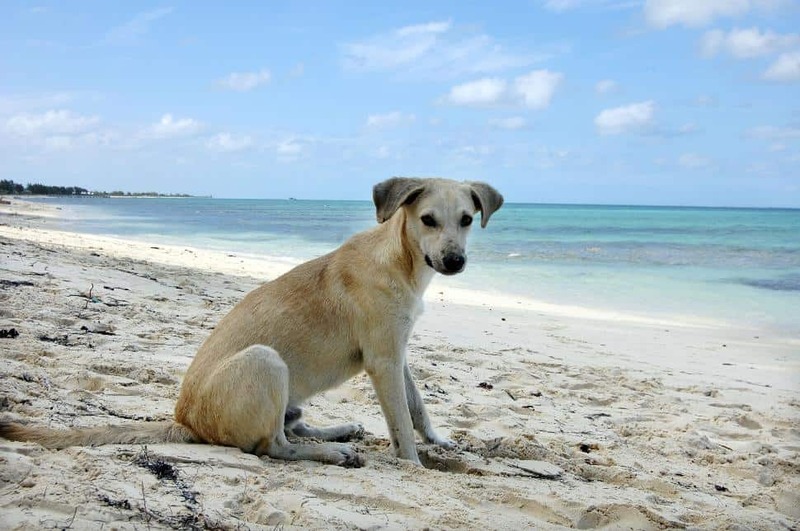 It’s also where we’re soon acquainted with Roger, one of the stray dogs that calls the beach home and hits up tourists for conch scraps. Now for a bit of a tutorial on conch. You’ll instantly recognize the big beautiful pearl and pink curved shell. What you might not know is inside this pretty shell is a sea animal resembling a chunky snail that has become the national dish of Turks and Caicos. 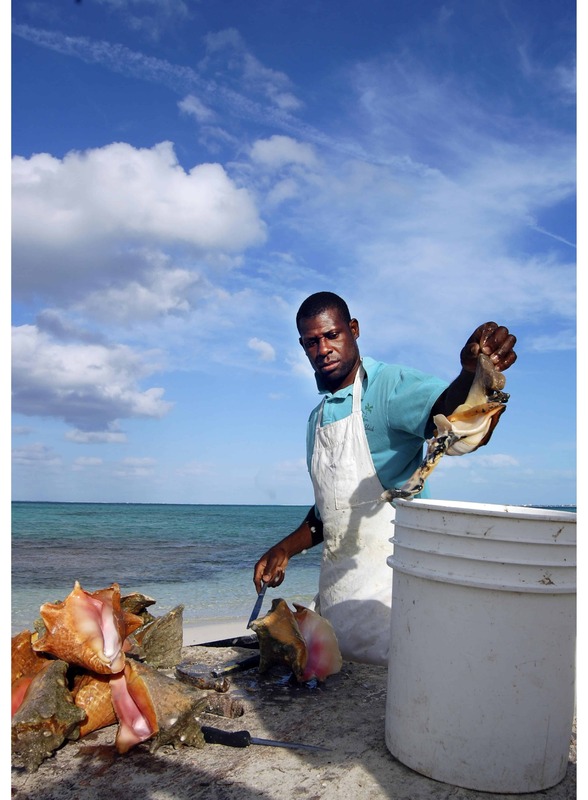 The firm white meat of the conch is relatively tasteless raw and on its own. But the texture is perfect for creating seafood dishes ranging from raw salads, chowders and stir-fries to fritters, curries and creole stew. 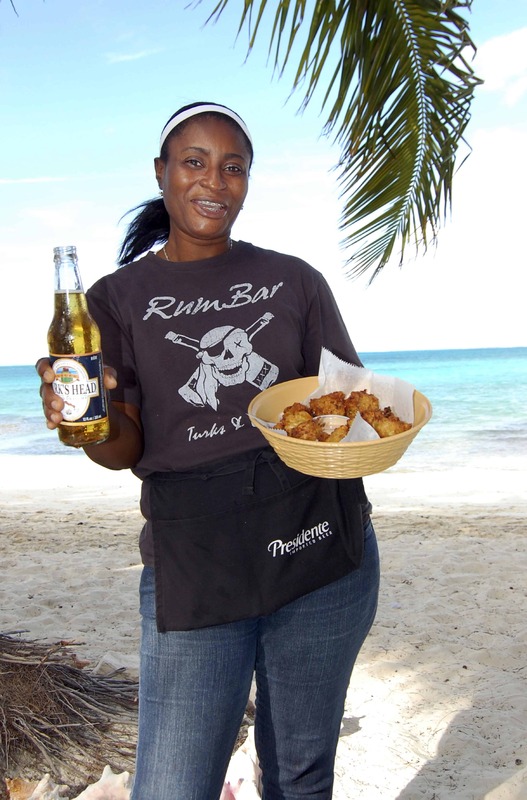 Of course, Da Conch Shack has them all on the menu and we quickly order conch fritters, Turk’s Head for my wife and I and non-alcoholic fruit punch for our daughter. Enough said. We soak up the atmosphere, hear Adele and Michael Buble songs set to a reggae beat and feed Roger a fritter (anyone who has food is his potential friend). Then we catch a glimpse of Gaan Geahheah heading out to catch conch. Well, there's not much to ‘catching’ conch because they lay listlessly on the ocean floor just waiting to be plucked for a tasty meal. As such Geahheah doesn’t have to go much farther out than waist deep to pick the sparkling shells and fill up his waiting kayak. By the time he’s back on shore a small crowd of tourists, including us, of course, have assembled to watch him pull the meat from the shells to fill a white bucket. Geahheah seems a little perplexed why we’ve gathered and are snapping pictures ferociously, after all, he’s just doing his job. On the way out we shoot a portrait of Roger on the beach and my wife and daughter buy jewelry from beach vendor Marilyn Simmons. Back at Beaches Resort (the family-friendly brand of the couples-only Sandals Resorts, which has properties throughout the Caribbean) we continue with the conch theme. 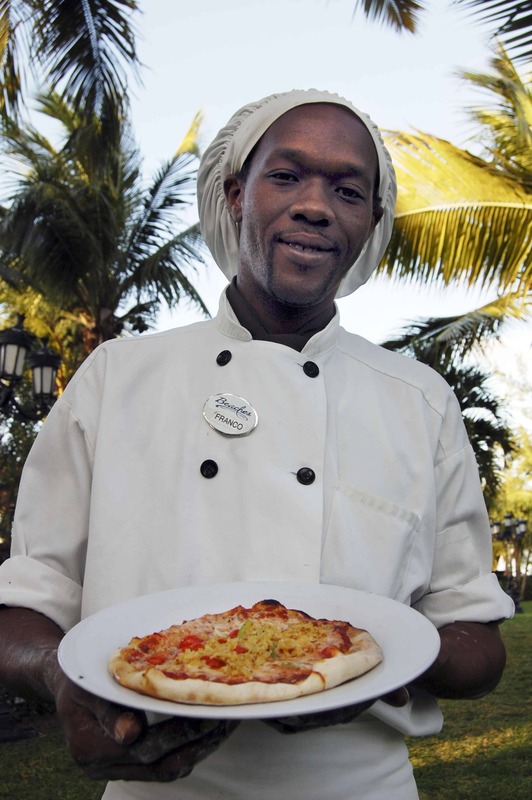 At outdoor Bella Napoli Pizzeria chef Franco Malcolm has become the first to put conch on a pizza. “It’s a natural. I’m surprised no one has done it before,” he said. Conch will also pop up at three more of Beaches’ 16 restaurants. At Barefoot by the Sea it’s in a zesty salad with tomato, onion, cucumber, lime and Scotch Bonnet pepper. At Schooners it makes an appearance in another salad and tomato broth-based chowder. And even at the Japanese restaurant Kimonos we nosh on the conch gyoza appetizer. Just so you don’t think all we did was eat conch on this holiday, we enjoyed all the resort had to offer, after all it’s massive with 615 rooms and suites designed perfectly for families. It has a prime spot right on Grace Bay Beach, seven pools, waterpark, kids’ clubs and activities, spa and snorkel excursions. That’s how we found ourselves out on the Kitty Katt catamaran and dropped off to spy conch, of course, parrot fish, lobster, snapper, doctor fish, grouper and loin fish in the Princess Alexandra Marine Park. Then the Kitty Katt glided up to Little Water Cay so we could frolic on the deserted island’s pristine beach and dunes. 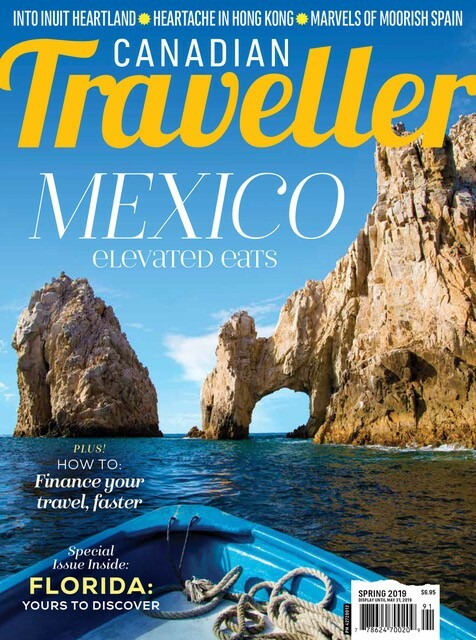 • WestJet and Air Canada fly to Turks and Caicos from Toronto and Montreal. 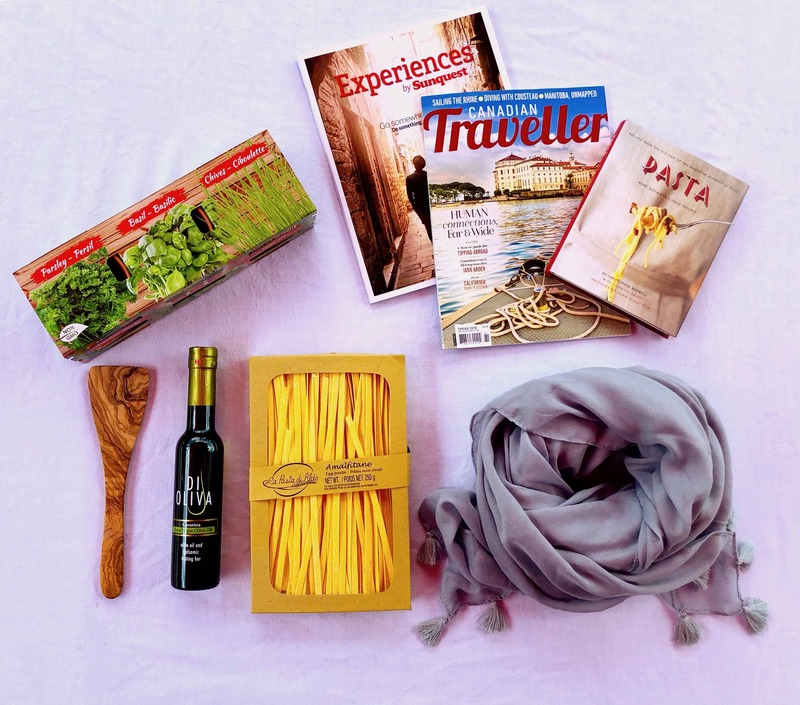 The two airlines also package all-inclusive stays at Beaches with flights. • Check out Beaches.com, DaConchShack.com, WestJet.com and AirCanada.com. • General information at TurksAndCaicosTourism.com. I've never been high-fived and hugged as much as the day I dropped by Enid Capron Primary in the Caribbean island nation of Turks and Caicos. As my 10-year-old daughter Grace and I pulled into the parking lot children in sharp yellow-shirt-and-brown-shorts school uniforms instantly gathered at the foot of the stairs and waved. As we walked up the stairs the crowd parted and it was high-fives all round as we passed every pupil. The high-fives would continue in the classroom through introductions, story time and the checking of workbooks. The hugs wouldn’t come until we were about to leave and Grace and I were surrounded in a collective embrace in which the kids declared over and over again that they didn’t want us to leave. A few even said: Take me with you. Needless to say it was a feel-good day and an eye-opener of what people are up to outside of Canada. Enid Capron Primary is mish-mash of low-slung cinder-block buildings surrounding a dusty courtyard. While there are palm trees on the property swaying in the breeze, this isn’t the tropical paradise of the nearby all-inclusive five-star resorts and upscale condominium complexes. 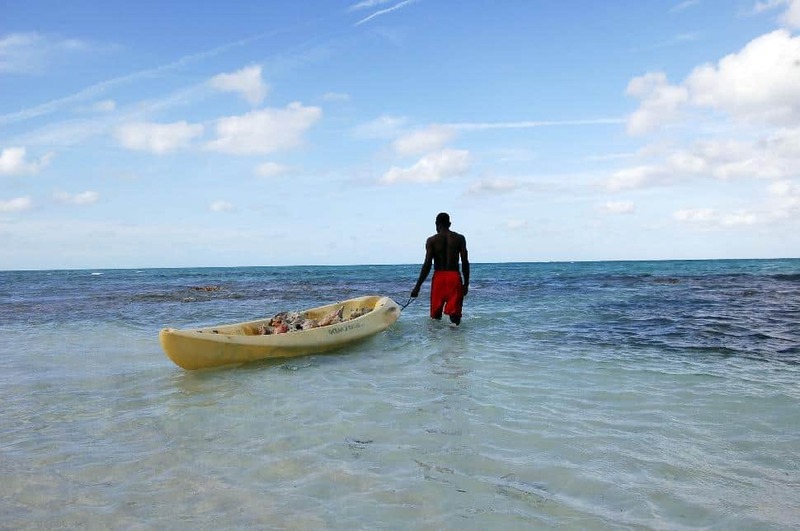 Turks and Caicos isn’t necessarily poor, but government schools are basic and anything extra – say even a library and books, basketball court and playground – usually has to be paid for with fundraising. This is where the Sandals Foundation and sun-seeking Canadian tourists come in. 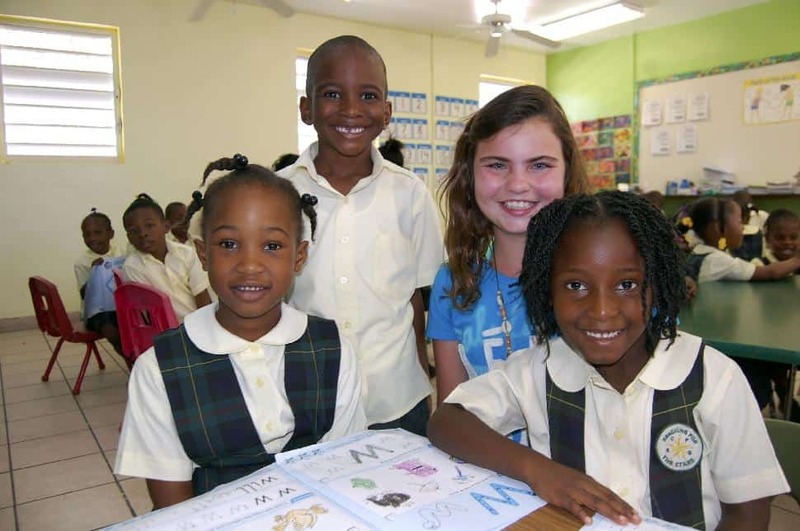 The foundation raises money for projects on all of the islands where it has properties and on Turks and Caicos that’s Enid Capron Primary. The Sandals Foundation has helped put in a library stocked with books, a reading garden, playground, basketball court, science building and provides food for its breakfast, lunch and snack programs. Every Thursday Beaches Resort runs its Reading Road Trip excursion so guests can drop by the school for a quick tour and read to a class. Tourists are invited to bring their favourite kids’ book to share and then leave it for the library. Grace and I arrived armed with Mermaid Sister and Perfect Picnic. The excursion also costs $20, which goes straight to the foundation, and only takes two hours out of your week long all-inclusive holiday, so it can be considered voluntourism light or giving back while on vacation 101. The kindergarten class Grace and I visited wanted to know if we were staying at Beaches (yes), if there’s snow in Canada (yes) and why I had such hairy legs (must be my Scottish bog person ancestry).